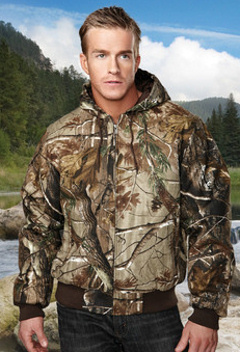 Custom embroidered camo camouflage Jackets, officially Licensed REALTREE® , Tri Mountain and Port Authority Brands. 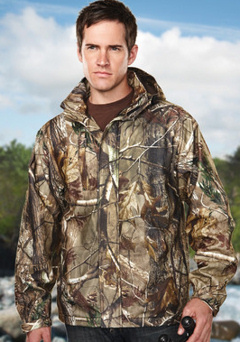 Get ready for the hunt and be prepared with this awesome selection of Camo Camouflage heavy duty, warm embroidered jackets. For more camo choices, see the links below. 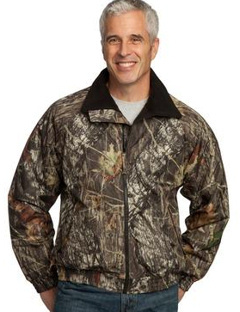 Custom embroidered Port Authority ® - Mossy Oak Camo Camouflage ® ChallengerT Jacket. J754MO. A long-time favorite, the Challenger has a traditional design and a durable, water-repellent shell to keep you warm and dry. With plenty of color choices and styles, this jacket is consistently a top performer. Tri Mountain 8886C Mountaineer Camo, 3 season Realtree AP pattern. Custom embroidered Tri Mountain 8886C Mountaineer Camo Camouflage, 3 season Realtree AP pattern. 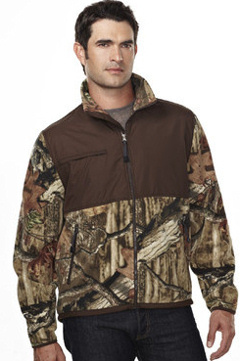 Designed for the hunt, this three-season jacket features the popular Realtree APT pattern. Constructed with a shell of windproof/water resistant polyester micro twill and is lined with heavyweight 11.2 oz. anti-pilling Panda FleeceT. Features include two front zippered pockets, inner zippered pocket and the EmbAccess system for clean embroidery. Adjustable cuffs and an open bottom with draw-cord hem for a custom fit. 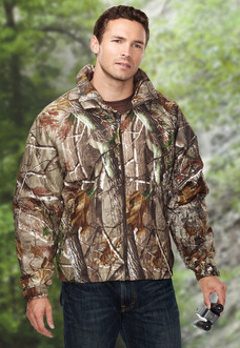 Tri Mountain 4686C Timberline Camo Camouflage , Realtree APT & Mossy Oak® Break-up Infinity® patterns. Custom embroidered Tri Mountain 4686C Timberline Camo , Realtree APT & Mossy Oak® Break-up Infinity® patterns. Warm and durable, the Timberline Camo work jacket features the popular Realtree APT & Mossy Oak® Break-up Infinity® patterns. Constructed with a heavyweight 13 oz. cotton twill shell, a 6 oz. polyfill quilted body lining, and 4 oz. polyfill quilted sleeve linings. Two front zippered pockets and an inner zippered chest pocket. Ribbed cuffs and waistband provide a custom fit. Tri Mountain 7450C Frontiersman Camo Camouflage 10.2 oz. Heavyweight Micro Fleece Jacket. Custom embroidered Tri Mountain 7450C Frontiersman Camo Camouflage 10.2 oz. heavyweight 100% polyester anti-pilling micro fleece jacket. Featuring olive nylon panels on the front and back yoke, back forearms and along the bottom. Accented with chest and side zippered pockets, elastic-bound cuffs and the EmbAccessT system for clean embroidery. Adjustable drawstring bottom with cord locks provides a custom fit. Slight drop tail. Tri Mountain 9486C Reticle Camo waterproof breathable jacket. Custom embroidered Tri Mountain 9486C Reticle Camo Camouflage. The Reticle Camo waterproof breathable jacket features a super soft and quiet shell of brushed polyester, with an 8000MM waterproof rating and 800G/M2 breathability rating. Fully seam-sealed and lined with a 7.4 oz. polyester knit body and nylon sleeves. Accented with an adjustable snap-off hood, two-way zipper and double storm flap. Adjustable Velcro cuffs and draw-cord bottom hem provides a custom fit. Plenty of storage room in various pockets including the zippered chest with utility loop and inner chest pocket. License tag loop on back body. EmbAccessT system for clean embroidery. Custom Embroidery Included.